Today, HCL Technologies, one of the leading global IT services provider announced their first ever global Twitter recruitment campaign. The twitter recruitment campaign is named as #COOLESTINTERVIEWEVER where HCL will conduct a series of interviews exclusively over twitter starting from February 10. The campaign will run for around 3 weeks which connects the participants with the HR executives of HCL via twitter. As per the sources, the top 5 applicants will participate in one-on-one interviews via the social media platform and in the final week, HCL will select a winning candidate to work for 12 months with the option of one of the following roles. Along with this, the winner will also receive upto $75,000. 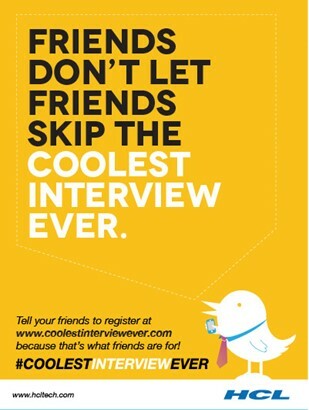 For more detailed information and more about the #COOLESTINTERVIEWEVER campaign, visit http://www.coolestinterviewever.com. To participate in the “Coolest Interview Ever”, follow @hcltech on Twitter and tweet answers to the questions asked starting February 10.